National Youth Leadership Camp was organized by PG. & Research Department of Social Work, Sacred Heart College (Autonomous), Tirupattur in collaboration with Xavier Board of Higher Education in India, Bengaluru on 9th and 10th March, 2019. Totally 55 youth from nine colleges from Southern part of India participated in the camp. They were Auxilium College, Don Bosco College, Marian College, St. Philomena’s College, Mount Carmel College, St. Joseph’s College Of Commerce, Gonsaga College, Providence College and Sacred Heart College, Tirupattur. The camp was well appreciated and the camp enabled the leadership capabilities of the youth. 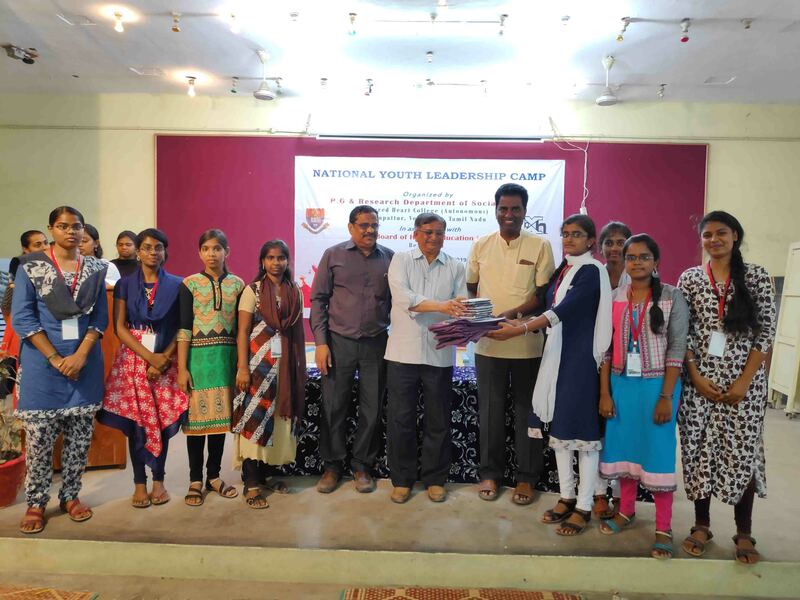 National Youth Leadership camp was organized to enhance the leadership qualities of youth. The camp was inaugurated at 9.30 am by Dr. Sr. Annammal Philip FMM, the Secretary General, Xavier Board, Bengaluru, Rev. Dr. C. Antony Raj, The Rector and Secretary of Sacred Heart College, Tirupattur and Dr. S. Paul Raj the Head Department of Social Work. Rev. Fr. Henry Daniel Ambrose welcomed the dignitaries and the participants from the various colleges. Rev. 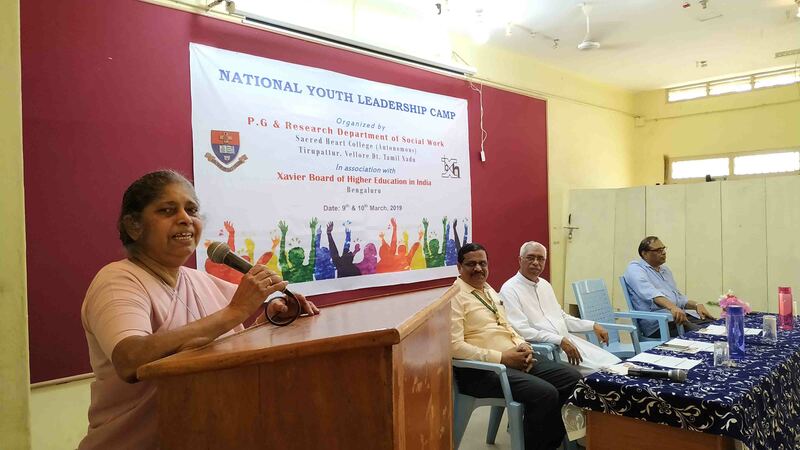 Sr. Annammal Philip delivered the inaugural address emphasizing the importance of youth in nation development. Rev. Dr. C. Antony Raj shared his words of inspiration and wished the camp to be successful and fruitful. Dr. C.R. Christi Anandan proposed a vote of thanks. At 10.00 am Dr. Clayton Michael Fonceca conducted ice breaking session to make the participants feel at home. At 10.15, Rev. Dr. J. Immanuel SJ, National Advisor, AICUF, Chennai conducted a session on the theme Understanding the Society and Politics in Today`s Context. He highlighted the current scenario in India and the role of youth for social change. Students actively interacted with him by way of clarifying the realities in today`s context. At 12.00 noon, the resource person, Mr. Gnanaraj, Co-Founder, Ministro Foundation, Chennai conducted a session on the Civic Responsibilities of Youth and Volunteerism. The session was full of activities and simulation games enabling the role of youth in civic management and enhanced volunteerism. At 2.30 pm, Mr. Sambath, Lad2Leader Consultancy and Training Services conducted a session on Youth and Scope for Entrepreneurship. This session highlighted the various scopes for the youth to be social entrepreneurs. 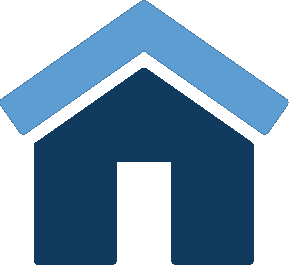 The resource person used a number of videos of successful entrepreneurs. At 4.45 pm, the importance of fitness for youth and the importance of sports and games were given by Dr. K. Arockia Raj, Assistant Professor followed by it. Throw ball match was conducted for girls and boys separately. Each match was thrilling and the participants enjoyed playing this outdoor game. Dr. C.R. Christi Anandan, the Assistant Professor gave the instruction for the cultural programmes from the participants. At 8.15pm, the students performed varieties of cultural programmes on various themes such as, women empowerment, road accidents, violence and peace. All the students had to partake in this cultural programme. The participants were divided into five teams and they performed varieties of programmes in the forms of dance, mime, skit and singing. The events were colorful and energetic. Dr. S. Paul Raj, the Head of the Department gave good night thought, which is one of the traditions of Salesian Institutions. He emphasized on the need for continuous learning and unlearning to be a better person. The fruitful day came to the end. In Day II at 9.00am, the resource person Ms. Latha Munuswamy, the Student Counsellor from Sacred Heart College conducted a session on Youth and Use of Media. In this session, she highlighted the power of media and its positive and negative impacts in the lives of youth. She suggested the various ways to make the media a powerful instrument of positive image building and social change. At 10.45 a.m. the resource person Dr. J. Henry Rozario, the Director and Principal Consultant of Exodus for Training and Development Pvt. Ltd and the Youth Work Specialist for three decades, Conducted a session on “Youth Leadership and Youth Led Development”. The activities were inspiring and enriching. The participants were thrilled to discuss the leadership qualities and skills. At 2.15 pm, there was a poster preparation and presentation on various themes concerning youth and nation development. Dr. Clayton Michael Fonceca coordinated the session. Various themes such as; women empowerment, violence, environment development, health and wellbeing and corruption were presented by the students for which cash prize was announced. At 03.30 p.m. Valedictory function was conducted where, Rev. Fr. Leslie Moras, President, Xavier Board, Bengaluru was the Chief Guest and Rev. Dr. D. Maria Antony Raj, the Principal, Sacred Heart College and Dr. S. Paul Raj, Head Department of Social Work was present during the function. In the valedictory address, Rev. Fr. Leslie Moras, highlighted the inevitable contributions of Christian Educational Institutions and Xavier Board as well. He requested the youth to use the resources and support and contribute back to the peace and nation building. Certificates and prizes were given to the winners in the sports, cultural programme and Poster presentations. 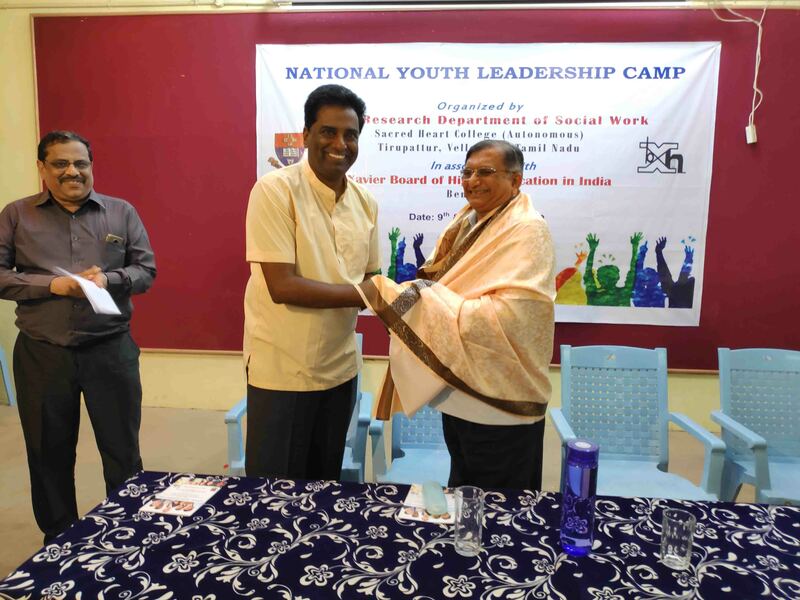 Dr. S. Paul Raj, proposed a vote of thanks to Xavier Board, Management of Sacred Heart College, Staff of Social Work Department, Student Volunteers and Participants from various colleges and their principals who made the two day National Youth Leadership Camp a great success.